June brings with it the Good Food and Wine show, and more events than any one person can handle. After visiting the cellar door earlier this year, we decided to join Cynthia and Rolf, from Rolf Binder, for a fabulous dinner at Noir in Richmond. The menu consisted of five courses: canapés on arrival, two entrées, a main and dessert. There was also a rather impressive array of wines, from new releases to magnums of older releases. 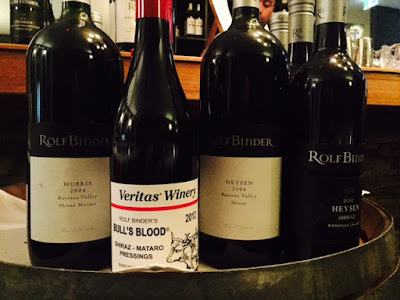 The Bull's Blood is definitely one they are known for and a bit of a favourite. The first entrée arrived; the most delicately presented dish I've ever seen. Kingfish with broad beans, and a 2014 Chardonnay. Next was the main, and an impressive selection of four beautiful reds. From left to right: 2012 Heysen Shiraz, 2004 Heysen Shiraz (Magnum), 2012 Bull's Blood, 2004 Bull's Blood (Magnum). The 2012 Heysen was definitely my favourite for the evening. With these impressive wines came a lovely piece of beef, served with a beetroot puree, apple, walnut and a zingy sprinkle of Roquefort. Not the best piece of beef I've eaten but certainly pleasant and a great match to the chosen wines. Last, but certainly not least, was the dessert course: a selection of cheese, fruit paste, bread and biscuits (and someone beat me to it), and some chocolate truffles. This last course was paired with a 2012 Hanisch Shiraz, and a 2001 Hanisch Shiraz. Both very impressive reds.